Horribly neglected, Sarah nearly died of tuberculosis at the age of four. Her mother had run off with her latest fling. Sarah was left with a nurse who lived with her new husband in an unheated, damp single-room with no ventillation. After three months of existing in such deplorable circumstances, her aunt Rosine discovered the near-death girl sitting on a street curb playing with a dead leaf. Sarah stayed with her aunt for a short time until her mother finally returned. Judith had no maternal instincts and took little interest in her daughter. At the age of eight, Sarah still could not read or write. Doctors predicted the extremely frail girl would not live into adulthood. Sarah begged her mother for a pretty coffin to prepare herself for the final resting place. Judith relented and bought a rosewood coffin lined with white satin. 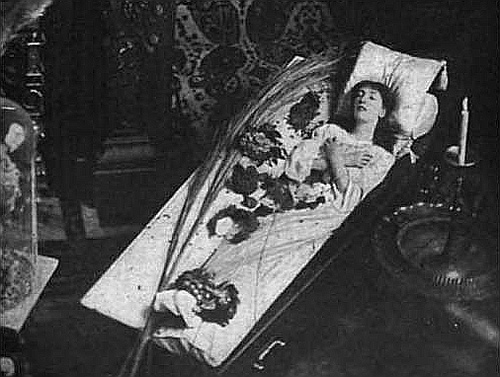 As an adult (long after outliving the dire prediction) Sarah continued sleeping in the coffin, even taking it with her during travels. Believing her earthly time short, Sarah was determined to live life to the fullest. Her mother, wishing to get the girl out of her way, sent little Sarah to Madame Fressard’s pension for young ladies, in Auteuil. Two years later, Sarah entered the convent of Grandchamps at Versailles. The other schoolgirls teased her mercilessly over her exotic appearance. She responded by flying into rages so terrible that she’d fall to the ground in convulsions. However, the nuns were kind and the Catholic rituals appealed to the highly dramatic girl. After receiving First Communion in 1856, she became a religious fanatic. She later claimed, “The Son of God became my cult and the Mother of the Seven Sorrows my ideal.” Yet, she never forgot her Jewish origins. When asked by a reporter if she was Christian, she replied: “No, I’m a Roman Catholic, and a member of the great Jewish race.” She never allowed any anti-Semitic talk within her company and was openly pro-Dreyfus during that case’s hysteria. Sarah was horrified at the idea. The only actress she’d ever seen was Rachel. Rachel had been France’s greatest tragedienne, but was dying of tuberculosis when nuns had pointed her out to Sarah. The nuns told Sarah that the hollow-eyed hag-like creature had brought on her illness by her sinful profession. Sarah fled from the room, screaming she would never be an actress. However, that same evening she was taken to the Comedie Francaise with her mother, the Duc de Morny, Alexandre Dumas, and Regis Lavolie. Included in the grand audience were such notables as the Empress Eugenie, Princess Mathilde, and George Sand. Sarah sat spellbound as the red curtain rose. She wrote in her memoir, “It was the curtain of my life which was rising.” The play was Racine’s Britannicus. Sarah fell into a rapture, feeling every character’s emotions as though her own. Dumas put his arm around her while she sobbed. He later told the Duc de Morny that he’d been correct. The girl was destined for the stage. 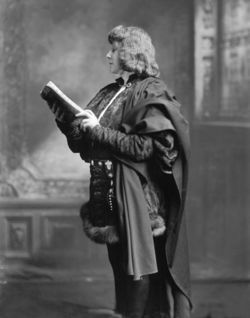 The duc de Morny succeeded in getting Sarah an audition for the “National Conservatory of Music and Declamation.” The jury would consist of leading members of the famed Comedie Francaise. Sarah now determined to be an actress, attacked the audition with, “that vivid exaggeration which I embrace any new enterprice.” She spent a month perfecting her voice under the guide of Monsieur Meydieu. The audition was held a month later. Sarah waited in paralyzing fear for her turn. When she was finally called up, she announced her plans to recite Phedre, act 2, scene 2. Unfortunately, Sarah hadn’t brought someone to read her cues or even a copy of the play. About to be kicked off the stage, Sarah quickly declared she’d enact the fable, The Two Pigeons. The jury couldn’t hide their snortling. Sarah began reciting in a quivering voice. This was the first instance of the horrible stage fright that would often haunt her. But then, an inner strength came forth. Sarah began again and recited the story with such emotion that she was admitted into the school. Sarah proclaimed she was going to be the greatest actress who ever lived. This was not mere arrogance. She studied acting with feverish devotion; practicing diction and memorizing countless roles. This fierce dedication continued throughout her entire life. Sarah performed in more plays and garnered mixed reviews. After a few off-stage melodramas, she was released from the company. Sarah quickly landed a position at the Odeon. Located on the Left Bank near the Luxembourg, it was considered the Second Comedie Francaise. Her big break came with the 1868 revival of Dumas’, Kean. Cast in the leading female role of Anna Damby, Sarah performed in an almost dreamlike state. She received her first solo curtain call. Sarah missed the exuberance of the Odeon, finding the players at the Comedie rigid and solemn. Unhappy, her first performance of Almanach de Gotha garnered unfavorable reviews. She redeemed herself a few nights later as Junie in Racine’s Britannicus. Soon afterwards, Sarah returned to the ranks of stardom. Sarah’s love for animals was well-known. As a child, she collected spiders, lizards, and crickets. When Sarah played Cleopatra, she insisted on using a real snake for the death scene. Her home was a zoo of domestic and wild animals. When Alexandre Dumas visited her house the first time, a puma ate his hat. Only a few minutes later, a gray parrot flew in the room, landed on his shoulder and began biting off the buttons of his waistcoat. Despite great success, Sarah tired of the Comedies’ rigid conformities and set her sights upon England. Sarah, now a societaire of the Comedie Francaise, arrived in London in June 1879. Her arrival was greatly anticipated. Her extraordinary art was already near legendary. However, London was unprepared for Sarah’s acting style. 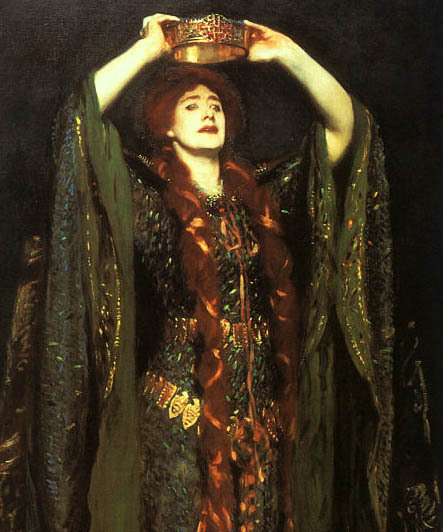 Her fiery boldness was in sharp contrast to England’s darling Ellen Terry’s poetic sincerity. The two actresses greatly admired each other and became lifelong friends. In 1874, Sarah faced her greatest challenge to date. 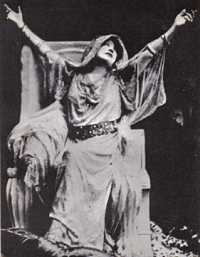 For over two centuries, Racine’s Phedre had been considered the greatest challenge for any French actress. Sarah was petrified. Before making her first entrance, she whispered, “quand meme!”. It turned out to be a magical performance. She acted with her entire body and soul. Sir George Arthur said, “her grief and horror of herself were so poignant as to turn, for those of us who heard the agonized tones, horror for the sin into something like pity for the sinner.”. The ovation was thunderous. After the last curtain call, Sarah fainted. Provost’s criticism proved wrong. Racine could forgive Sarah. His Phedre would become Sarah’s masterpiece. After conquering England, Sarah set her sights on America. She landed in New York on October 27, 1880. Her American premiere was at Booth’s, “Temple of Dramatic Art” on November 8th. She performed the starring role in Adrienne Lecouvreur. The house was packed with New York’s elite. When Sarah made her first entrance in the second act, the audience fell spellbound at her incandescent light and grace. Sarah became an overnight sensation. Newspapers reported her every move. Fashion pages published daily accounts of her dresses and jewels. Merchants sold everything from Bernhardt perfume, candy, cigars to eyeglasses. Sarah’s final performance in New York was a matinee of La Dame aux Camelias. This was one of her most popular roles. Unlike past actresses who over-emoted- Sarah apporached the part of Marguerite Gauthier with graceful, heartbreaking frailty. There were twenty-nine curtain calls after the finish. After Boston, Sarah continued to conquer cities around the world. From Philadelphia to Montreal to Chicago. When Sarah finally returned to France she was met with an indifferent, quiet hostility. The French believed she’d insulted the names of Racine and Moliere by performing to vulgar Yankees and cowboys. Undeterred, Sarah made a surprise appearance at the Opera House. The curtain rose and the audience gasped at the sight of her. Sarah burst into Aux armes, citoyens! At the end, the audience went mad. Even President Grevy threw large bouquets of roses at her feet. “La Divine” had made her triumphant comeback. Sarah’s career lasted until 1922. Her last performance was in Verneuil’s, Regine Arnaud. That same autumn she began rehearsing Sascha Guitry’s play, Un Sujet de Roman. She collapsed the night of the dress rehearsal. 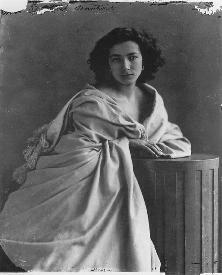 Although her first words upon awakening were, “When do I go on?”- Sarah Bernhardt never performed again. She spent her last month in bed. Devoted fans held vigil outside her house. Sarah’s career spanned over sixty years. She played diverse roles from King Lear’s Cordelia, Cleopatra, Othello’s Desdemona, Lady Macbeth, Jeanne d’Arc, Gismonda, Lysiane, Medea, the title role in Hamlet, Roxane in Cyrano de Bergerac, Anddromache’s Hermione, to Portia in Merchant of Venice. It has been noted that her publicity was so vast, that if all the reviews and articles written about her were pasted end to end it would reach around the earth. And a pile of her photos would be as tall as the Eiffel Tower. This is even more impressive when considered she acted in a time before television or the internet.